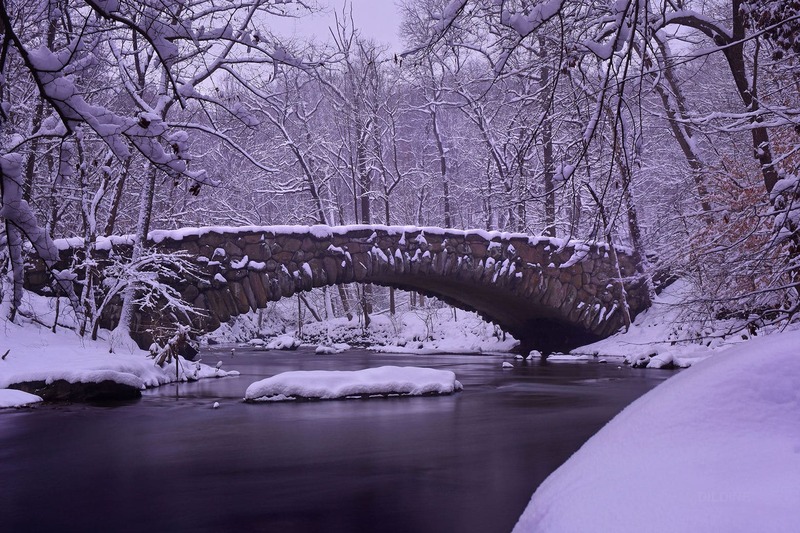 Two strangers wanted to capture a serene, snowy scene at Rock Creek Park in photos. But the picturesque moment during Sunday's snowstorm turned into a life-or-death situation. Here's what happened during a rescue that involved one of WTOP's very own. WASHINGTON — Two strangers out to take photos of a beautiful, snowy night ended up in a life-or-death situation together in the height of Sunday’s snowstorm. The rescue in Rock Creek Park involved one of WTOP’s very own. After leaving work around 4 p.m., WTOP reporter and photographer Dave Dildine headed over to Rock Creek Park. He’d been angling for a shot of Boulder Bridge in deep snow at dusk for a while and knew the storm would be an ideal opportunity to finally capture that scene. He succeeded, packed up his gear and began the mile-long hike back to his car. As he neared Western Ridge trailhead on Broad Branch Road around 6 p.m., he heard a muffled moaning noise and faint screaming. “I looked over this railing and saw her flailing around in this pool of water,” Dildine recounted a day later, standing in the exact spot where he spotted a woman drowning in the creek. “I shouted, ‘Hang on! I’ll be right there,’ … went down to the creek, which at that point was pretty deep and yelled for her to swim toward me. ‘Come toward the shore,'” Dildine said. The moment he reached the water, he realized there would be no one else to help either of them. Before he could call 911, Dildine said the woman’s face began to dip below the surface. He dropped his phone in the snow and went in. “There was a sheet of ice that was very fragile that immediately started creaking as I walked out on to it. And then, when I walked out onto the edge, I just fell through it,” he said trying to stay above ground for as long as possible. Chest deep in water, Dildine reached out and grabbed the collar of the woman’s jacket, pulling her onto his chest and swimming backward toward the bank, making sure to keep his head above water. Dildine said he manuevered them over a thin sheet of ice, pulling her stiff body until they reached the snow. Minutes before she fell, the 27-year-old said she was also trying to take a picture of the snow. Seeing a better angle for her shot, she left her running path and climbed up onto the railing along Broad Branch Run and swung one leg over it. Kirkpatrick fell about 8 feet into the soft powder, which cushioned her landing. Seeing no other option, she attempted to climb back out and slipped again — this time into Broad Branch Creek. “All I was thinking was stay above water or try to grab something, a rock. I do remember trying to grab a rock and I missed it. And I was thinking, ‘Try and find your feet,'” she said, noting when she fell her head went underwater. Shocked by the cold and coughing up water, Kirkpatrick struggled to kick as her heavy jacket took on water. “It felt like paralysis. I couldn’t move my limbs … I remember my face going in the water and thinking, ‘Well, this is how it ends.’ I cannot move. I cannot get my body to move. I was trying so hard,” she said. Dildine assessed his options on the creek bank – looking for anyone walking by, any threats or immediate clues to how the woman came to be in the creek by herself at dusk. He said he didn’t have time to come up with another way to reach her, looking up to see the woman’s face drop into the water. At that moment he knew he had no other option but to go in and save her. “She was underwater. She was submerged when I got out there. Her entire face was underwater. So, I grabbed her by the collar and pulled her above the surface and started dragging her to the shore, but that’s a lot of water weight and it’s cold. We’re both soaking wet. There’s only so much time you have left,” he said. Dildine reached for his phone in the snow and called 911. U.S. Park Police confirmed the dispatch at 6:30 p.m. on Jan. 13 for a woman drowning in Broad Branch Creek. But Dildine said help was slow to arrive in the snowy conditions. A traffic reporter by day, Dildine knew where they were in Rock Creek Park and directed emergency responders to their exact location where Broad Branch Run meets Blagden Avenue Northwest. It is something he said is a common problem in emergency situations. “‘I’m in a creek, can you come get me?’ That doesn’t work. That’s not good enough. You need to know where you are at all times. If you’re out on a hike in a park — even an urban park — you have to be aware of your surroundings. Because you never know what you’ll be up against a moment later,” he said. Dildine is an avid explorer, always outside practicing his photography and has learned through experience how quickly a situation can turn dire. He knew to try to stay dry, to keep Kirkpatrick conscious and do what he could to get her body temperature up. He intentionally stayed above the water, walking out onto the ice as long as possible knowing it would eventually cave. And while he’s reluctant to take credit for his quick thinking and heroism, his experience coming into the moment served him well. While Dildine called for help, Kirkpatrick was struggling to understand what was going on around her. She still could not extend her legs and was having trouble getting a breath as she laid in the fetal position in the wet snow. “I could hear him on the phone with the dispatcher, saying, ‘We’re coming, we’re coming.’ I remember him saying, ‘I’m going to hold you, is that OK?’ I guess he was just trying to be polite. Like, ‘Oh my god, yes, please put yourself around me. I am freezing,” she recalled. So, he did. Using the dry portion of his body, he covered her, hoping to transfer as much body heat as possible. “As I yelled for help, I tried to use the dry portion of my body to warm her as much as possible, knowing she was in a serious state of hypothermia. I was worried she was going to die in my arms,” he said. Within minutes, Dildine said he noticed Kirkpatrick’s condition was worsening. “I knew from what little experience I’ve had, when you stop shivering, that’s a really bad sign. When she went unconscious, that’s when I got really, really scared,” Dildine said. Kirkpatrick noted how much difficulty she had speaking after Dildine pulled her out of the water. Torn with anxiety as Kirkpatrick began to lose consciousness, Dildine left her side, running in wet clothes multiple times up the steep hill in hopes of finding help. When she reached the hospital, emergency room staff told Kirkpatrick, who they referred to as Jane Doe, that her body temperature was 90 degrees. She had a dangerously low heart rate and her organs were starting to preserve themselves, Kirkpatrick said. Hours after EMTs rushed her off to the hospital, Dildine heard from first responders that the woman he saved was going to be OK. But he still didn’t know her name or how she came to be in the creek in the first place. 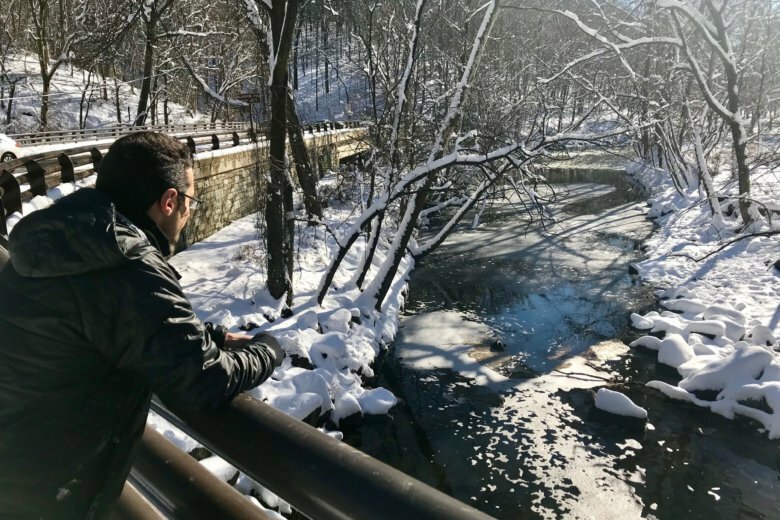 The following day, Dildine had more questions than answers and wanted to return to the spot in Rock Creek Park where he risked his safety to save a stranger, not only to process what had happened, but also to see it in the light of day. WTOP’s Dave Dildine and Megan Cloherty returned to Rock Creek Park the day after the rescue to put the pieces together. This video was taken before they had reconnected with Kirkpatrick. As reporters, Dildine and I are not used to being part of the stories we cover. But we were curious and wanted to look for any clues that could explain how the woman ended up in the water. We didn’t realize we’d end up finding out who she was. “You know, it makes even less sense now that I’m here, seeing it,” he said. “It just doesn’t make sense. Why was she there and why wasn’t she able to get to the shore? I wish we knew that you know,” Dildine responded out of frustration. Scouring the day-old snow tracks and the banks of the slowly moving waterways, we searched for the woman’s belongings, which Dildine had a hunch were sure to be nearby. “I’m kind of half-expecting to see a cellphone or something in the water,” he said. When we walked up to the bridge for a better view, I spotted something in the embankment below, covered by a light layer of snow. In green galoshes, Dildine made his way carefully to the pile that we’d later learn was exactly the spot where Kirkpatrick fell into the embankment bordered by rocks. The phone still had a small amount of battery. We plugged it in to find phone numbers displayed on Kirkpatrick’s lock screen and slowly began to unravel the mystery. The first was Kirkpatrick’s father in Texas. The second her roommate in D.C. Both had left worried text messages for Kirkpatrick the night before. After a few phone calls, we connected with Kirkpatrick herself, who decided to come into the WTOP studios to meet Dildine and fill in the blanks from that day. Watch Dildine and Kirkpatrick’s reunion in the video below. Both were grateful to see each other again and ask each other questions. Kirkpatrick said that, like him, she was also taking a photo. She was hoping to send her mother and sister photos of the snow along her running route — something they don’t see often in Texas. After slipping off the railing into the embankment, she thought she could possibly climb a low tree limb to reach the railing from which she fell. As a parting gift for Kirkpatrick, Dildine framed the photo he took while he was in the park that night: the reason their paths crossed in the snowstorm.